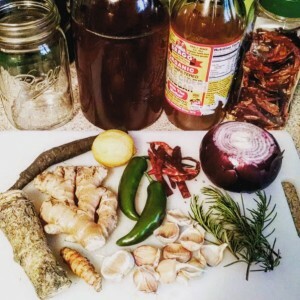 While you can find as many ways to make herbal medicine as there are blogs on the internet, the following is a short medicine making tutorial based on my more than 30 years of making herbal remedies. It’s important to know how to make the basics and to have many options to accommodate preferences. How can we support a person with herbs if they won’t or can’t take alcohol tinctures, don’t like the taste of teas, or think that all herbal medicine is hippy voodoo? The goal is to get the medicine to the people in a way that they’ll be happy to take so that healing can occur! Plants have walls around their cells which act as fortresses to keep the intracellular material intact and stable when the outside surroundings may be unfavorable due to environmental changes such as drought and direct sun. Cell walls have pumps and channels which allow for exchange of materials including alkaloids and nutrients from both inter- and intracellular activities. An alkaloid is a substance that causes a physiological change in the body. An example of an alkaloid is caffeine. Caffeine, as we all know, stimulates cardiac activity, raises the blood pressure, and affects brain activity. Too much caffeine can be detrimental to one’s health. In herbal medicine, it’s imperative to dose correctly to insure healing versus harming. When we buy dried cut and sifted plants to make herbal remedies, we have no idea of the correct identification beyond what the source says, the length of time the plant has been stored, whether the plant has been harvested sustainably, etc. I use freshly harvested plants as I believe they contain not only the best quality medicine and nutrition, but also the vital energy of the plant. Additionally, I collect the plants myself, to ensure that the harvesting is done at the right time of year and that sustainable harvesting methods are in place. In all herbal medicine, the plant material needs to be finely chopped. This goes for leaves, bark, roots, and some flowers. In order to make the finest quality medicine and allow the menstruum to easily pull the alkaloids and nutrients from a plant, it needs lots of open access. Think of it this way – it’s easier to get in a house that has open doors and windows than a house with tightly closed doors and windows. Sounds logical, yes? Yet many people either use whole plant material or roughly chopped. The whole point of making medicine is to help people be as healthy as they can be. We facilitate this by making the best medicine we can with our plants and menstruum. I fill my jars with finely chopped live plant material three-quarters of the way up the jar with all my remedies with the exception of herbal vinegars. With those, I pack the jars full. More on that later. Tincture: A tincture is an alcohol extraction of the medicinal alkaloids of a plant. Alcohol acts against a cell wall by its very drying nature to pull out the alkaloids within a cell through the channels by a dehydration process. Alcohol pulls mostly the “medicine” from a plant, although it may also extract some minerals such as iron. Alcohol tinctures are best utilized for the alkaloid content. To make a tincture, fill your jar three-quarters full with chopped plant material, then fill the jar all the way to the top with alcohol. Each plant may have a different alcohol proof need. Some plants have more water soluble alkaloids, which means using a lower alcohol proof of 80-100, while other plants have more alcohol soluble alkaloids, needing a higher proof alcohol. Generally, I use 151 proof for most of my tinctures. People ask about the 190 proof alcohols. Don’t use them. You’ll have to add some water anyway, so just stick with the 151. Let the tincture sit 2-3 weeks to fully extract the alkaloids, then strain. 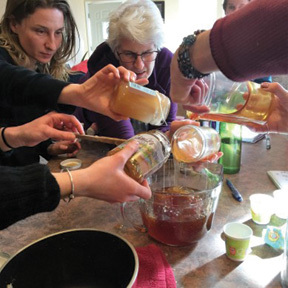 Elixir: An elixir is simply an equal part alcohol/honey extraction of plants’ medicine and nutrition. Honey is hygroscopic which means it draws water to it. What I appreciate about honey is its ability to pull both the alkaloids plus the nutrients from a plant’s cells. Elixirs are my personal favorite way to make herbal medicine. The resulting remedy is not only medicinal and nutritional, but tasty as well. For those who ingest alcohol, but don’t always like the taste of tinctures, they get the double bonus of a great tasting remedy with the addition of all the nutrition of the plant used. 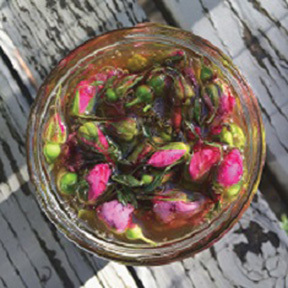 To make an elixir, start with filling your jar three-quarters full with chopped plant material. You’ll want to add the alcohol to the jar first, then top off with the honey. Equal parts. That means fill the jar halfway up with the brandy, then the honey after, as it takes a while for the honey to filter down through the plant material. Wait a few minutes and add more honey as needed. 80 proof brandy is what is typically used. Since alcohol and honey both draw out the medicine of the plant, a lower proof alcohol may be utilized. Elixirs need a 4-week steep before straining. Herbal extracted honey: Super tasty and versatile, herbal extracted honeys are a perfect fit for those who don’t/won’t ingest alcohol. The herbal honeys can be used in teas, on toast, oatmeal, licked from the spoon – the possibilities are many. To make an herbal extracted honey, fill your jar three-quarters full with chopped plant material, then fill the jar to the top with honey. It will take a while for the honey to drizzle all the way down to the bottom of the jar and fill. Patience, Grasshopper. Honeys require a 4 to 6-week steep before straining. To strain, put the jar with lid on in a sauce pan on the stove. Fill the pan halfway with water, then heat on low until the honey is thin enough to strain from the plant matter. This may take 10-15 minutes. Cool fact – the very center of a beehive is kept at 100 degrees by the bees’ labor. If you keep the heat on low, the honey should not go over 100-110 degrees, so no worries about the breakdown of the enzymes and good stuff. Oxymel: The Greeks invented the oxymel. Very smart, those Greeks! An oxymel uses equal parts apple cider vinegar and honey to extract the medicine and nutrients from plants. Brandy and honey make an elixir, apple cider vinegar and honey make an oxymel. Drying and heating plants destroy the flavonoids in plants! Oxymels, herbal honeys, and elixirs are rock stars at preserving the immune supporting and antiviral vitamin C complex and flavonoids. To make an oxymel, fill your jar three-quarters full with chopped plant material. Are you starting to see a pattern here? Fill half the jar with apple cider vinegar. Top off with honey. Tightly cover the jar and put it on a dish as there may be some leakage. Let steep for a month and strain. You now have an oxymel that can be taken by the teaspoon straight, added to fizzy water to make a shrub, use as an ingredient in salad dressings, and more. Herbal Vinegar: Vinegar extracts the vitamins, minerals, flavonoids, essential oils, and some alkaloids from plants as well flavors. The acidic nature of vinegar assists in the uptake of calcium and iron into our cells. For those dealing with health issues such as anemia, arthritis, and bone loss, herbal vinegars can be helpful in restoring health. To make an herbal vinegar, pack a jar tightly with finely chopped plant material, then fill to the top of the jar with apple cider vinegar. Add a piece of parchment paper between the jar and lid (if metal lid) to keep the lid from rusting, or use a plastic lid. Let the herbal vinegar stand on your counter for a month. Strain and enjoy! With all herbal medicines, make sure you label well. Consider putting the remedy’s uses and dosing on the label. When we’re sick, or hurt, or hungry, or in a chaotic first aid situation, it’s much easier to look at labels and clearly see which is best to use, instead of wasting time staring at all the jars and wondering what remedy to utilize. Well, there you have it! As always, I’m Wild About Plants and so happy to share some of what I know with you all. To gain a more in-depth understanding of these remedies, dosing, correct identification of plants and their uses and more, check out the upcoming workshops and/or apprenticeship programs at Cedar Mountain Herb School (www.cedarmountainherbs.com). Also see the expanded article at www.cedarmountainherbs.com/recipe-mineral-rich-herbal-vinegars/.